Khalil Gibran (born as Gubran Khalil Gubran in Bsharri, Mount Lebanon Mutasarrifate, Ottoman Syria, died in New York City, U.S.) was a famous Poet from Lebanon, who lived between January 6, 1883 and April 10, 1931. He became 48 years old. He was a Lebanese writer who emigrated to America and was a central figure in Majhar group consisting of Arab writers living in America. Gibran was one of the earliest Arab writers who broke with the traditional poetry form, and will be linked to both the romantic school and the movement of "free verse". He also wrote poetry and prose in English, and the mysterious, poetic prose work The Prophet was very popular in the West. 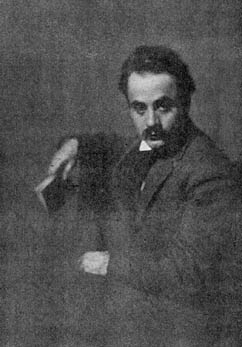 Gibran was also a skilled sculptor and multimedia artist, and studied, among other things art in France as a student of Auguste Rodin. He is born under the zodiac capricorn, who is known for Determination, Dominance, Perservering, Practical, Willful. Our collection contains 90 quotes who is written / told by Khalil, under the main topics: Love, Beauty, Death, Equality, Faith. "You have your ideology and I have mine"
"If you reveal your secrets to the wind, you should not blame the wind for revealing them to the trees"
"Knowledge of the self is the mother of all knowledge. So it is incumbent on me to know my self, to know it completely, to know its minutiae, its characteristics, its subtleties, and its very atoms"
"Out of suffering have emerged the strongest souls; the most massive characters are seared with scars"
"Progress lies not in enhancing what is, but in advancing toward what will be"
"To understand the heart and mind of a person, look not at what he has already achieved, but at what he aspires to"
"Would that I were a dry well, and that the people tossed stones into me, for that would be easier than to be a spring of flowing water that the thirsty pass by, and from which they avoid drinking"
"If the other person injures you, you may forget the injury; but if you injure him you will always remember"
"Trust in dreams, for in them is hidden the gate to eternity"
"Poetry is a deal of joy and pain and wonder, with a dash of the dictionary"
"Your daily life is your temple and your religion. When you enter into it take with you your all"
"Knowledge cultivates your seeds and does not sow in your seeds"
"Nor shall derision prove powerful against those who listen to humanity or those who follow in the footsteps of divinity, for they shall live forever. Forever"
"To be able to look back upon ones life in satisfaction, is to live twice"
"We choose our joys and sorrows long before we experience them"
"If you cannot work with love but only with distaste, it is better that you should leave your work"
"If you love somebody, let them go, for if they return, they were always yours. And if they don't, they never were"
"Time has been transformed, and we have changed; it has advanced and set us in motion; it has unveiled its face, inspiring us with bewilderment and exhilaration"
"Let there be no purpose in friendship save the deepening of the spirit"
"No man can reveal to you nothing but that which already lies half-asleep in the dawning of your knowledge"
"Of life's two chief prizes, beauty and truth, I found the first in a loving heart and the second in a laborer's hand"
"Generosity is giving more than you can, and pride is taking less than you need"
"Generosity is not giving me that which I need more than you do, but it is giving me that which you need more than I do"
"Hallow the body as a temple to comeliness and sanctify the heart as a sacrifice to love; love recompenses the adorers"
"I existed from all eternity and, behold, I am here; and I shall exist till the end of time, for my being has no end"
"I have learned silence from the talkative, toleration from the intolerant, and kindness from the unkind; yet, strange, I am ungrateful to those teachers"
"I prefer to be a dreamer among the humblest, with visions to be realized, than lord among those without dreams and desires"
"I wash my hands of those who imagine chattering to be knowledge, silence to be ignorance, and affection to be art"
"If my survival caused another to perish, then death would be sweeter and more beloved"
"If the grandfather of the grandfather of Jesus had known what was hidden within him, he would have stood humble and awe-struck before his soul"
"Life without liberty is like a body without spirit"
"Love and doubt have never been on speaking terms"
"Love possesses not nor will it be possessed, for love is sufficient unto love"
"Many a doctrine is like a window pane. We see truth through it but it divides us from truth"
"March on. Do not tarry. To go forward is to move toward perfection. March on, and fear not the thorns, or the sharp stones on life's path"
"Most people who ask for advice from others have already resolved to act as it pleases them"
"Rebellion without truth is like spring in a bleak, arid desert"
"Sadness is but a wall between two gardens"
"The eye of a human being is a microscope, which makes the world seem bigger than it really is"
"The just is close to the people's heart, but the merciful is close to the heart of God"
"The lust for comfort, that stealthy thing that enters the house a guest, and then becomes a host, and then a master"
"The most pitiful among men is he who turns his dreams into silver and gold"
"The obvious is that which is never seen until someone expresses it simply"
"The person you consider ignorant and insignificant is the one who came from God, that he might learn bliss from grief and knowledge from gloom"
"When love beckons to you, follow him, Though his ways are hard and steep. And when his wings enfold you yield to him, Though the sword hidden among his pinions may wound you"
"When we turn to one another for counsel we reduce the number of our enemies"
"When you are joyous, look deep into your heart and you shall find it is only that which has given you sorrow that is giving you joy. When you are sorrowful look again in your heart, and you shall see that in truth you are weeping for that which has been your delight"
"Wisdom ceases to be wisdom when it becomes too proud to weep, too grave to laugh, and too selfish to seek other than itself"
"Wisdom stands at the turn in the road and calls upon us publicly, but we consider it false and despise its adherents"
"Work is love made visible. And if you cannot work with love but only with distaste, it is better that you should leave your work and sit at the gate of the temple and take alms of those who work with joy"
"Your living is determined not so much by what life brings to you as by the attitude you bring to life; not so much by what happens to you as by the way your mind looks at what happens"
"Zeal is a volcano, the peak of which the grass of indecisiveness does not grow"
"Advance, and never halt, for advancing is perfection. Advance and do not fear the thorns in the path, for they draw only corrupt blood"
"All our words are but crumbs that fall down from the feast of the mind"
"All that spirits desire, spirits attain"
"And ever has it been known that love knows not its own depth until the hour of separation"
"Art is a step from what is obvious and well-known toward what is arcane and concealed"
"But let there be spaces in your togetherness and let the winds of the heavens dance between you. Love one another but make not a bond of love: let it rather be a moving sea between the shores of your souls"
"Coming generations will learn equality from poverty, and love from woes"
"Death most resembles a prophet who is without honor in his own land or a poet who is a stranger among his people"
"Exaggeration is truth that has lost its temper"
"Faith is a knowledge within the heart, beyond the reach of proof"
"Faith is an oasis in the heart which will never be reached by the caravan of thinking"